It may have the name of one of the most beautiful and famous actresses of the 1950s, but Jayne Mansfield's Car is not a movie about glamour or Hollywood; it is a movie about war. OK, technically it's a movie about the clash between a Southern family and a British one when the woman who united them dies, but the new film directed by and starring Billy Bob Thornton has war lurking everywhere in it. Thornton's character and his two brothers (played by Kevin Bacon and Robert Patrick) are World War II veterans, their father (played by Robert Duvall) fought in World War I, and the film is set in 1969, as thousands of young men are being sent off to yet another war in Vietnam. You'd better believe that sounds like a stacked cast, and in this exclusive, brand-new poster for the film, you can see just how deep the talent runs. The British family is played by John Hurt, Ray Stevenson and Frances O'Connor! Kevin Bacon is playing a hippie! Even if you've never heard of Jayne Mansfield, that's a cast that can get anyone's attention. 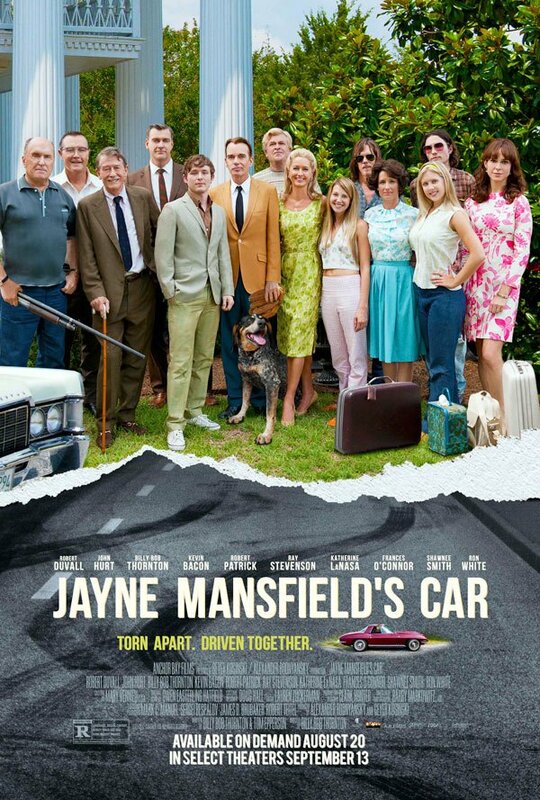 And hey, aren't you dying to figure out how Jayne Mansfield's car figures into the story at all? To find out you'll have to buy a ticket-- or hit the "rent" button on your remote.